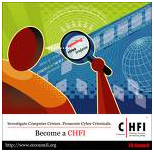 The goal of this five-day accelerated EC Council authorized CHFI Boot camp class is to educate cyber crime investigators in the techniques of computer forensics investigation. During the program, students will live, learn, and take certification examinations at one of our state-of-the-art education centers. This blended-learning program employs outcome-based (Lecture | Lab | Review)™ delivery - that focuses on preparing you with the real-world skills required to pass the EC Council examination, which is delivered at the conclusion of the program. As information technology and the Internet become more integrated into today's workplaces, organizations must consider the misuse of technology as a real threat and plan for its eventuality. When cyber crime strikes, the real issue is not the incident itself, but how the organization responds to the attack. CHFIv8 presents detailed methodological approach to computer forensics and evidence analysis. It is a comprehensive course covering major forensic investigation scenarios that enables students to acquire necessary hands-on experience on various forensic investigation techniques and standard forensic tools necessary to successfully carryout a computer forensic investigation leading to prosecution of perpetrators.